What happens to all the horses who are no longer able to work in the grueling horse carriage business – the ones who have pulled carriages full of tourists on asphalt streets, breathing in car exhaust; on the most humid days? Certainly a life in a horse sanctuary or one on a farm being loved by a wonderful family only awaits a very few. The average working life of a NYC carriage horse is only four years. 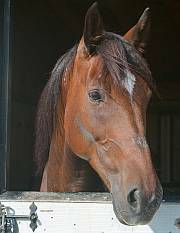 When a horse is no longer able to do the job, the easiest and quickest way for an owner to dispose of him is to bring the horse to auction – such as the infamous horse auction in New Holland, Pennsylvania. Many of these horses are sold for slaughter – a sad end to a sad life. A few, however, are saved and live out their days in peace and contentment. These are some of their stories.